So a while back I did a 50 line demo to show how little code it takes to make WebGL content when using the WebGLU library. Since then I've simplified and consolidated WebGLU in addition to adding new features. One of the biggest (code length wise) was to load shaders from a file and add a default shader as well as a couple other simple shaders. Hopefully WebGLU will grow to include many cool and useful shaders. Some may ask: Aren't you just moving the complexity into other files? After all it's really just as long, just all split up. My answer is: Yes. The point being that these are the only 25 lines you, as a WebGL application developer, would need to care about. Forgive me if I am being stupid, but I don't see it? I also do not see it. I'm running FF 4.0 with about:config webgl.force-enabled = true. I have your latest jscript source and I created the 25-line example locally and modified the source file references and I still do not see anything. 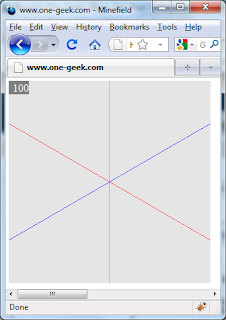 I am able to see other WebGL demonstrations but not any using WebGLU. Any quick thoughts?